Brighouse Town were 2-0 winners away to Pickering Town yesterday to move closer to clinching a place in the Evo-Stik NPL East promotion play-offs. Morpeth were crowned champions with a 3-1 home win over second-placed Pontefract Collieries, who still have a four-point cushion over the rest. 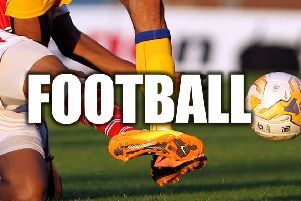 Vill Powell’s side stay fourth and there were also wins for Ossett United, Sheffield FC and Tadcaster Albion in the jostle for positions near the top. A strong, cold wind made life difficult at Pickering’s Mill Lane ground and possession was shared but the visitors had more of a cutting edge. Tom Robinson might have scored for the visitors inside 30 seconds, his long-range effort against the wind hitting the top of the bar. Robinson later had a goal disallowed for a marginal offside. The scales tipped Brighouse’s way on 30 minutes when Pickering missed a good chance to open the scoring and play quickly moved to the other end where Zeph Thomas set up Aaron Martin to score. It was Martin’s 22nd goal of the season and moves him level with the sidelined Eli Hey at the head of the divisional scoring charts. Danny Earl, who was a threat wide on the right, and experienced former Scarborough player Ryan Blott ensured Pickering stayed in the hunt and it was not until 15 minutes from time that the visiting fans could breathe a little easier. Centre back Kurt Harris cashed in on good work from substitute Tyler Williams when the ball came back into the box following a corner. It was Harris’ fourth goal in three games. 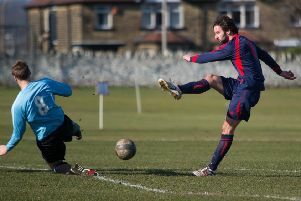 Brighouse can now look forward to Easter weekend games against lowly opposition, at home to Carlton on Saturday and away to Spalding United on Monday.